Specially formulated by dental experts, the AQUAFRESH Little Teeth Toothpaste is ideal for use by children between the ages of 3 and 5. Gently cleansing young teeth while providing Sugar Acid Protection from the fluoride, this strengthening formula actively defends against cavities and ensures that the roots are set for a healthy set of adult teeth as they grow. Provided by a leading brand in tooth protection, this 50ml pot has been made to last with only a small amount needed for each brushing session. 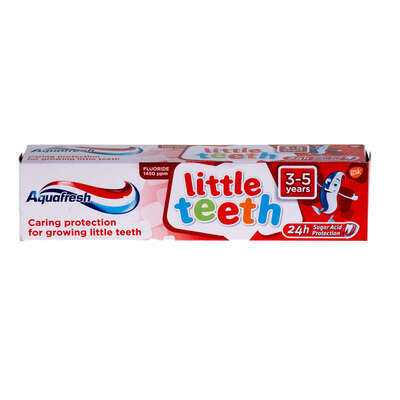 For younger children, we also stock AQUAFRESH Milk Teeth Toothpaste 0-2 years 50ml.